Henry Holt and Co. (BYR), 9781250155016, 40pp. Steadfast Fortitude and curious Patience are waiting every morning to greet visitors of the Library. That is until, one early morning, when Fortitude finds Patience is missing. The city is about to awake, and the lions absolutely must be in their places before the sun rises. Now, Fortitude must abandon his own post to find his best friend in the Library’s labyrinthine halls. 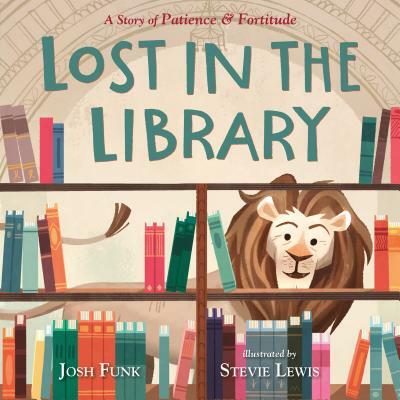 With Josh Funk's clever rhymes and Steview Lewis' vibrant art, Lost in the Library introduces young readers to a pair of unforgettable lions, as well as the famed New York Public Library, and includes bonus material loaded with facts about Patience, Fortitude, and the NYPL's history. Josh Funk is the author of several books including Lady Pancake & Sir French Toast, It's Not Jack and the Beanstalk, and How to Code a Sandcastle. Although he is allergic to cats, Patience and Fortitude have fur made of marble and caused no problems when writing this book. Stevie Lewis has been living on the road, furthering her passion for climbing, art, and the outdoors. Striving to live simply and tread lightly on the earth, she gathers inspiration from a variety of places, be it climbing in the high desert in central Oregon, hiking in the wilderness of Alaska, or sharing laughs with fellow travelers around a campfire. After working for four years in animation, she now illustrates children's books and creates art based on her travels. Stevie's books include A Week without Tuesday, Finding Serendipity, and Lost in the Library.